From modest beginnings over 70 years ago, the fair trade movement today is a global enterprise representing over 2 million producers and workers. The movement believes that trade can be a fundamental driver of poverty reduction and greater sustainable development, and disadvantaged farmers, workers and artisans can develop the capacity to take more control over their work and their lives. The fair trade movement is supported by people across all five major continents, largely through Fair Trade Towns. These are communities of people and organizations which are working to promote fair trade in their area and use their everyday choices to increase sales of fair trade products and bring about positive change for farmers and workers in developing countries. Becoming a Fair Trade Town is a shared achievement and an opportunity for local authorities, schools, businesses, community organizations and activists to work together. La Mesa became one of the first Fair Trade Towns in California several years ago. 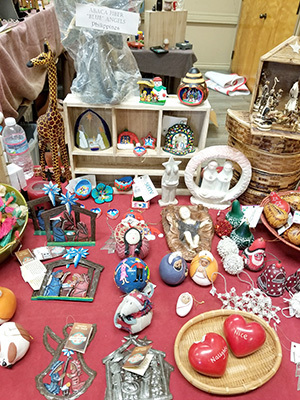 On Wednesday, Dec. 6, the La Mesa Foothills Democratic Club (LMFDC) will host a Fair Trade Faire that will feature a great assortment of imported coffees, teas, chocolates, handcrafted artisan baskets and jewelry, clothing, accessories and works of art from around the world. We’ll have a dozen boutiques and local companies exhibiting their wares, sure to give you a head start for your holiday shopping for friends and family. Be prepared to make multiple purchases from these great, dedicated fair trade vendors. 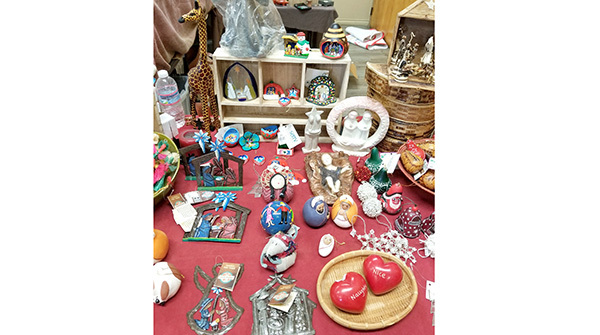 Our La Mesa fair trade organizers will be there to remind us of other local suppliers of fair traded goods, such as Windmill Farms in Del Cerro. We’ll also hear from four candidates running for County Supervisor in District 4. Nathan Fletcher, Lori Saldana, Omar Passons and Kenneth Marlbrough have all been invited to spend a couple minutes with us with updates on their campaigns for supervisor, and we’ll decide on our formal club endorsement at our subsequent Jan. 3 meeting. And as tradition holds, we will welcome all members and guests to enjoy our holiday feast, with turkey, ham, and all the trimmings supplied by the club. Members are encouraged to bring shared serving portions of appetizers, side dishes, salads, and desserts to augment the club’s meat carvings, veggie entrees and beverages. We’ll start our festivities at 6 p.m., so come prepared to buy some great holiday gifts for friends and family and enjoy our wonderful pot luck dinner. We ask each member and guest to contribute $5 (suggested donation) at the door to offset the costs of our holiday provisions. We’ll be meeting at the La Mesa Community Center, 4975 Memorial Drive, just north of University Avenue in La Mesa. Because of the overflow crowds for this annual event, we ask willing and able members to park by the Little League field and take the short walk up the stairs to the Community Center. Let’s leave the adjacent parking lot for those that most need to be close to the meeting room. We also ask each member and guest to contribute to our annual holiday charities. Again this year, we are supporting the efforts of the Food Bank at Santa Sophia Church to feed needy families in the Casa de Oro area. Please bring canned and nonperishable foods that can help provide for the several hundred local families in need during the holiday season. They also like to give out “street-ready” foods such as high protein bars, fruit and nut snacks, and pop tarts. We also support the efforts of La Mesa United Methodist Church who offer the city’s homeless citizens hot showers and other necessities during the fall and winter months. We ask that you bring some new, unused toiletries and/or gently used clothing for those who don’t take these items for granted. LMFDC draws members from the communities of Allied Gardens, San Carlos, Del Cerro, the College Area, La Mesa, Mt. Helix, Casa de Oro, Santee and other nearby East County communities. All residents are welcome to attend our monthly meetings which take place on the first Wednesday of each month. Please visit our website for coming events at lamesafoothillsdemocraticclub.com and like us on Facebook. — Yahairah Aristy is president and Jeff Benesch is vice president of programming of the La Mesa Foothills Democratic Club. Reach them at jeffbenesch@gmail.com.